Picture a walk-up Chinatown restaurant sandwiched between an ATM kiosk and a gaudy awning that reads “Golden Unicorn Restaurant.” The venue, titled Jobee, is not just unassuming -- it’s downright unappealing. This is the east end of Howard Street, where knock-off Chanel bags trade almost as frequently as plates of dim sum, and the air smells perpetually of fried oil. Now picture a gaggle of women in shift dresses and leather jackets standing right outside. Behind them stand a handsome couple, both in loud blazers and open-neck shirts, followed by a white-haired man in pointed alligator-skin shoes. You might think they’ve all taken a wrong turn en route to Soho House, but in fact, they’re precisely where they want to be. A male model named Vance stands beneath a neon sign flashing Taiwanese characters at the door, checking names against his guest list. 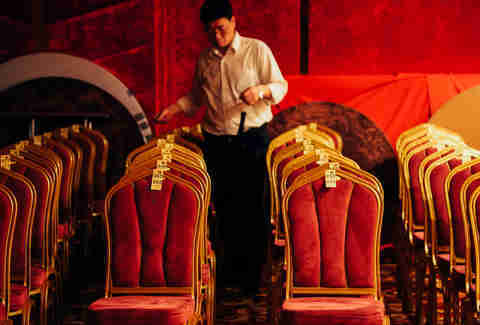 This was Madame Wong’s: an exclusive, after-hours pop-up club for the city’s it-crowd. By day Jobee carried on serving mediocre fried rice; by night, it played host to a series of the most elite parties in the city. Since closing in 2011, it has spawned a string of similarly low-concept parties for high society. And the mastermind behind this unlikely club scene remains none other than Mr. Travis Bass. At 51, sporting a pair of boxy, Clark Kent-ish glasses, Bass is among Manhattan’s great impresarios. Neither a promoter nor a venue-owner, he is the ringmaster of Downtown nightlife -- part events-planner, part genial socialite, part fashionable hype-man. The orchestration of Madame Wong’s is his legacy. 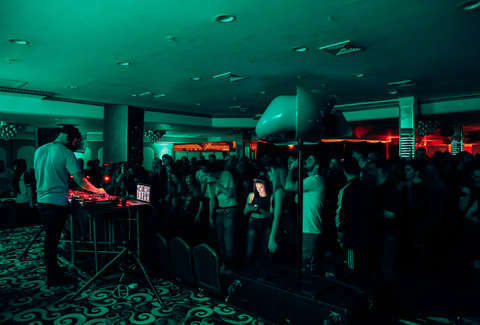 Bass first found the idea for his elusive event series while traveling with a friend in Berlin. In search of an alternative to the city’s glitzy, over-blown party scene, he found himself in a bar littered with old newspapers and empty glass bottles -- a place too janky to earn the label dive. “It was so real and so cool,” he tells me. “It had this ‘found object’ vibe.” Upon returning to the city, Bass reached out to Vance Brooking -- a male model and former Le Bain dancer -- and DJ Mae Wok. 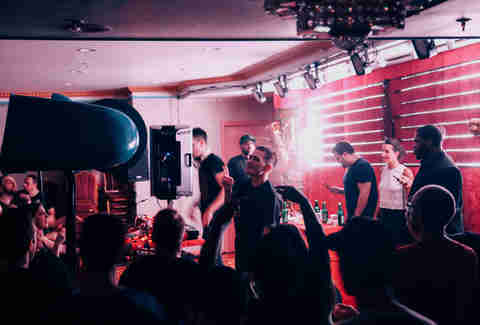 Together they resolved to throw a party with the same DIY feel of the Berlin joint. To keep budget as low as possible, they found a venue with a basement and a liquor license -- Jobee -- and began to craft a guest list. “The whole concept was ‘whatever we had’,” Bass jokes. “I had Chinese silk lanterns from an event I’d recently thrown for a Chinese bank, and some sculpted letters left over from a Pepsi event. I found some green paint in a warehouse, so I painted the walls green. I told my friends to bring curtains and pick things up off of the street.” And somehow, the fashion elite came running. And it was ephemeral. These days, the party has moved on to new venues, and Jobee has, in the parlance of Google, “permanently closed.” Nostalgia doesn’t get more instant. "I'm so tired of parties that are cool, and China Chalet is not cool, which is why it's great." On party nights, an all-ages-crowd lines up outside, clad in whatever outlandish apparel fashion has deemed of the moment. No one checks IDs -- 19-year-old models sip vodka sodas with octogenarian design veterans. Inside, tables and chairs are shoved thoughtlessly into corners, Chinese lanterns remain in their usual spots on the walls, and the daytime wait staff stands awkwardly to the side, serving drinks in paper cups and watching silently while boys in overalls ash their cigarettes on the drab carpet. “I’m so tired of places that are cool,” James Nevin, founder of a Williamsburg art mag called The Journal told The New York Times at the quarterly’s release party. “China Chalet is not cool, which is why it’s great.” Girls with painted lips sniff bumps of cocaine off of their house keys, and fashion photographers climb onto tables, cameras in hand. Tattooed DJs rub elbows with published poets and design icons. It’s easy to forget that come morning, this place will transform back into a mediocre dim-sum joint, populated by a sleepy lunch crowd oblivious to the previous night’s escapades. And while you need not be a Grammy winner to earn yourself a slot on the guest list, you do need to be the friend of a cousin of the agent of someone who won a Grammy. Or simply a friend of Travis Bass. Everyone wants Warhol's New York, and Warhol wanted someone else's. Most New Yorkers operate on a work-hard, play-hard basis -- thankless 50-hour weeks punctuated by weekends of keep-’em-coming bar nights and dance floor debauchery. You spend the week building up steam, and the weekend blowing it off. You pound gin and tonics, momentarily forget your anxiety about the closure of the L train, and try to sleep with the girl seated next to you. That’s the prosaic routine. But what if you weren’t merely trying to get dizzy and fall into bed with anyone who evinces a pulse? These parties are meant to foster conversation about art, and literature, and fashion. They’re for hearing music you actually like, live or otherwise, and meeting people who you’d gladly have lunch with next Tuesday in broad daylight, perhaps in China Chalet itself. Maybe Bass is right -- maybe we are always a decade too late for the city’s prime. New York of 10 years ago will forever remain cooler than our present-tense version of the place -- the Chelsea Hotel of the ‘70s, the scratch-graffitied subway cars of the ‘80s, the starving-artist East Village of the ‘90s. Everyone wants Warhol’s New York, and Warhol wanted someone else’s. One day, someone will want your New York, especially if it’s a version of yours that never really existed. Eliza Dumais is the friend of a cousin of the agent of someone who won a Grammy. Follow her @elizadumais.